Double the fun with peppermint ganache! One of my favorite weekend rituals (besides making pancakes, of course) is getting tapioca tea from our favorite tea shop and then browsing the stacks at one of my favorite used bookstores, Bookbuyers, here in the South Bay. It's been a pretty busy few weeks lately, so I haven't had the chance to do this, but finally this weekend, I made the excuse that I needed to go to the bookstore to look for potential Christmas gifts! hehe. Alas, what did I actually get at the bookstore but a book for myself: David Lebovitz's out-of-print Ripe for Dessert (brand-new, too!). Merry early Christmas to me. 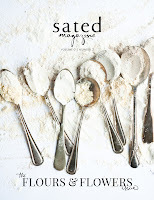 I absolutely adore Lebovitz's ice cream book, The Perfect Scoop, which is pretty much my bible for the summer months, so I was super-excited to be able to find one of his other books. 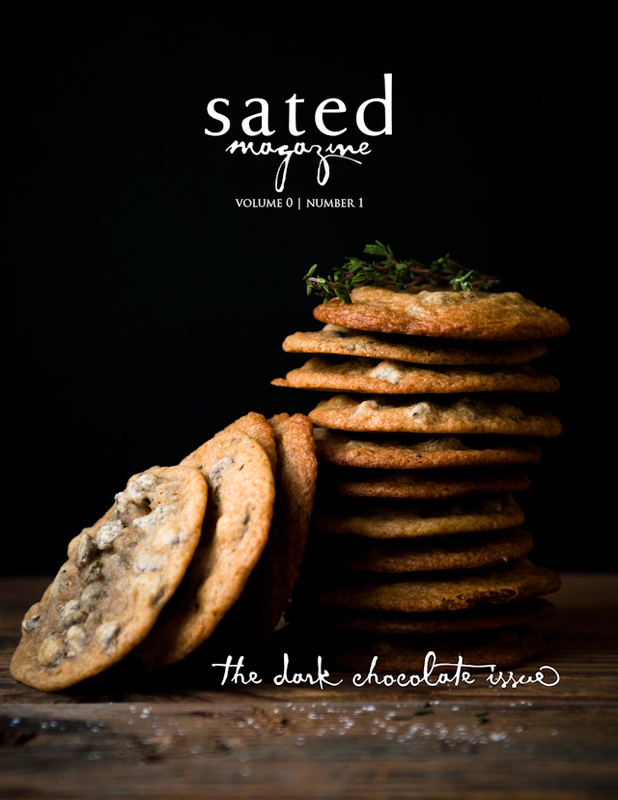 Flipping through it, I can't wait to try a bunch of the recipes! Okay, so what does this have to do with pancakes, you ask? 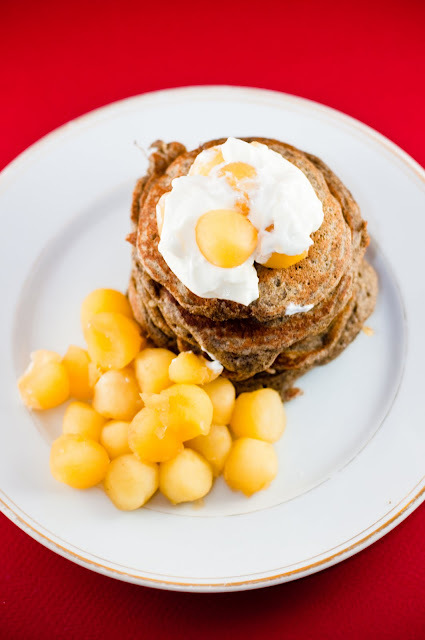 Well, one of the first recipes in Ripe for Dessert is one for buckwheat cake with cider-poached apples, which immediately sounded like a great idea for pancakes to me. And, what made it even better was that my roommate, who's Icelandic, left a container of awesome, awesome Icelandic skyr for me when she went home for Christmas, and the skyr, I thought, would be the perfect companion to buckwheat pancakes and poached apples. 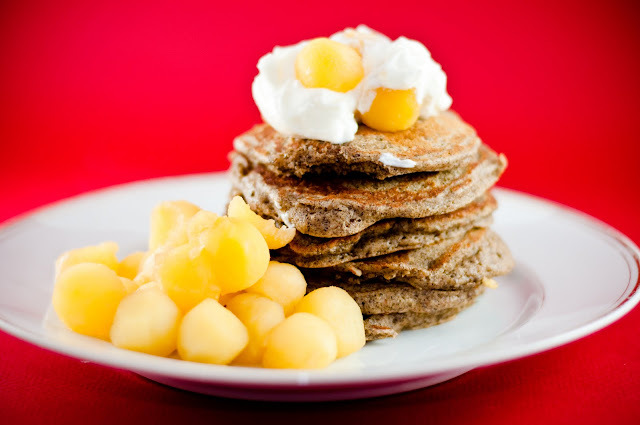 The buckwheat pancakes, while not the most appetizing color, are really fragrant and most definitely fill you up more than regular pancakes because they're so dense. I'm not usually a syrup-on-pancakes type of girl, but syrup in this case is most definitely recommended. Or do what I did and drizzle a bit of caramel sauce on top. 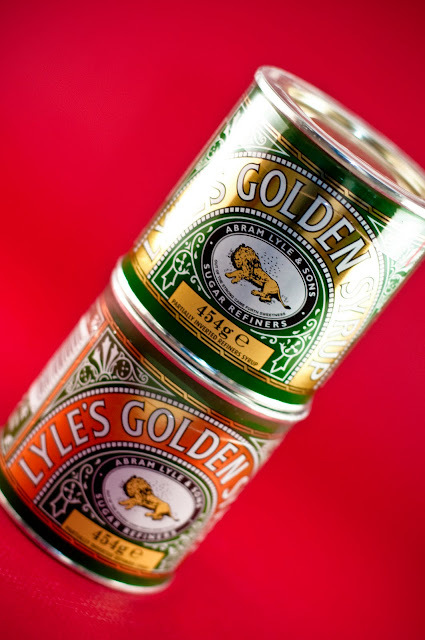 Or, even better, how about some British Golden Syrup? Dan Jurafsky, writer of a great food and language blog, The Language of Food, was telling me that I must try some of this golden syrup, so I asked my friend, Lauren, to bring me some when she came back from Oxford! I can't wait to dip into it, and I'm sure it would have been great on these pancakes, but I'm told that I need to make sticky toffee pudding, so that's what I'm saving the golden syrup for. Yum nom nom. In the meanwhile, enjoy this holiday week, everyone! I'll be posting more Christmas treats, including cupcakes! and more chocolates for Christmas gift ideas. Merry X-mas! 2. Peel and use a melon baller to scoop out the apple into small spheres. 3. Poach the apple balls in the cider mixture for about 10 minutes. 4. Meanwhile, prepare the pancakes. In a food processor, process the almonds and sugar until finely ground. 5. In a mixing bowl, combine buttermilk, eggs, melted butter, and vanilla. Mix to combine. 6. Add the ground almonds and sugar, buckwheat flour, baking powder, and salt. Mix to combine. If batter is thin, let sit for a while before adding more flour because the batter will thicken up a bit while the buckwheat flour absorbs the liquid. 7. Butter/oil lightly a medium hot skillet, and cook the pancakes. 8. Drain the apple balls and serve with the pancakes. Top with generous scoops of skyr and syrup or caramel, if using. Sounds great and looks good! Very nice presentation. Thanks for sharing information and recipes about buckwheat. I had buckwheat pancakes for breakfast on Saturday, too. I put cardamon and blueberry (blackberry?) sauce on mine. @lutin: ooo, yum. cardamom and blueberry! that sounds like a great combo! 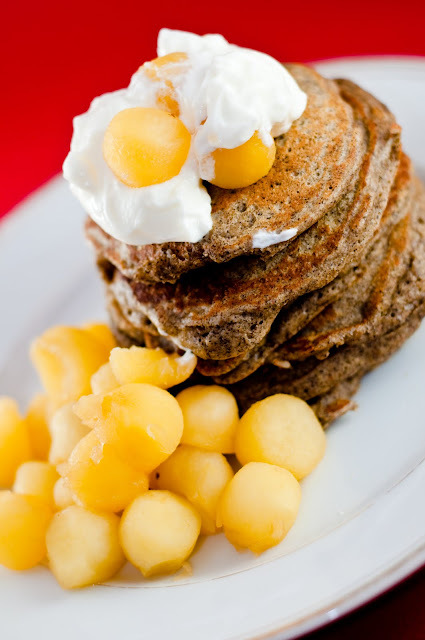 do you have a vegan recipe for buckwheat pancakes to share? May I please translate Your recepies to Estonian and publish as a cookbook? I am just so in love. And a first year Japanese student with very litte free time at hand, but enchanted. On Holiday for a week and combining ideas from different recepies found in this blog to create a Autumn pancake platter for my friends. Thank You for this joy... this blog overflowing Joy of Life!